One of the winners is Chan-Min Roh, a Grade 12 student at Luther College High School in Regina. Chan-Min Roh was driving in his car with his sister when he received the call. "I couldn't believe it," Roh told CBC's Saskatchewan Weekend. "I was really just gripping my wheel super strong." Roh was selected to become a Loran Scholar and receive $100,000 in funding for a 4-year undergraduate degree. Around 35 Grade 12 students are chosen to be Loran Scholars each year, out of an estimated 5000 that apply. The Loran Scholarships are meant to be a celebration of courage, compassion, grit and integrity, with a months-long application and interview process. Roh is a student at Regina's Luther College High School and is one of two Saskatchewan students selected, along with Emily Simon in North Battleford. The Loran Scholar process started with a preliminary application, Roh said. Extracurricular activities, community contributions and school contributions were all discussed. Ten people were selected for provincial interviews, then three were selected to go to Toronto for national interviews. "It was an amazing experience," Roh said. "It was a huge privilege to get to speak to all of them." A large part of the Loran Scholarship is based on extracurricular activities, which Roh said were important to relieve academic pressure. "To be able to do improv theater or one-acts or join the choir and run debate meetings outside of a classroom setting was so rewarding for me to just relieve that stress and immerse myself into the student culture." 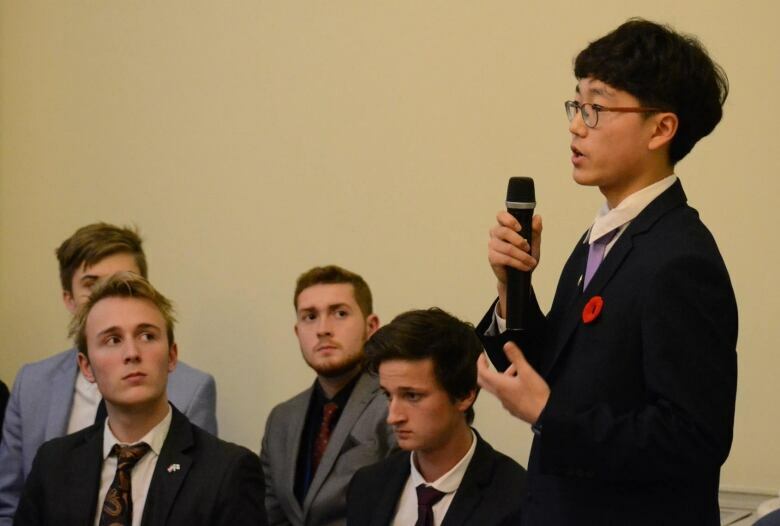 Roh said debate was the activity that opened so many doors for him, including participating in Youth Parliament, going to Finland to participate in a model European Parliament and attending a national seminar in Halifax. "I enjoyed this idea of having two different perspectives and ideas on one topic. This idea that we could agree to disagree in a civilized way," he said. "And through the use of logic you could try to convince someone from their original opinions and stance." Roh has also gone to Mexico with a youth delegation to build homes and leads a peer support group at Luther High School. "What's most rewarding for me personally," he said. "Is the bonds and relationships that form with so many different individuals from different communities." Next, Roh said he plans to study something along the lines of political science or international relations at McGill University or maybe University of Toronto. "Looking at careers and looking forward into the future, I could find myself working as a lawyer, diplomat or a journalist," he said. "I think what those things all have in common is a sense of duty." With files from CBC's Saskatchewan Weekend.